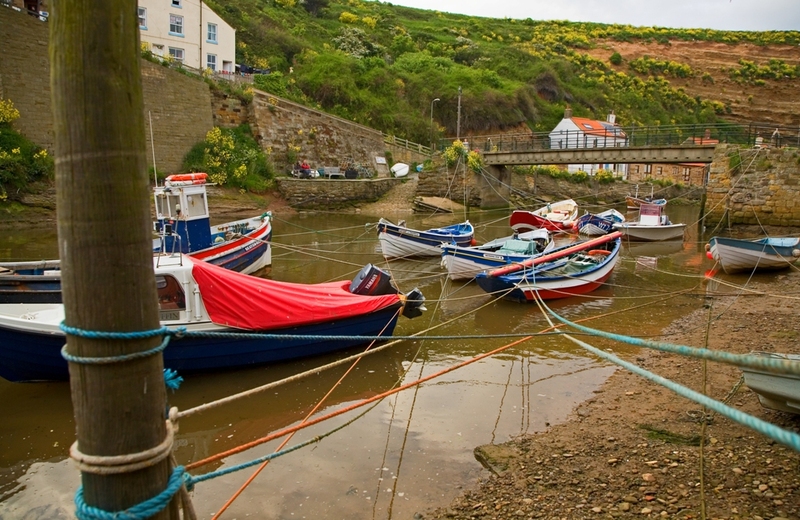 Real Staithes is situated within the North York Moors National Park a beautiful landscape of stunning moorland, spectacular coast, ancient woodland and historic sites. The sea edge of the North York Moors is a Heritage Coast, what’s a Heritage Coast I hear you ask..? Well in England and Wales just over a third of the coastline has been given special protection, there are 40 of these protected areas, they are know as Heritage Coasts. Many of these Heritage Coasts have been given this protection because of their geology. The North Yorkshire and Cleveland Heritage Coast is 36 miles long running from Saltburn to Scalby Ness, near Scarborough. It’s rugged beauty and light have attracted countless painters and photographers who have tried to capture its special features, but there’s nothing like visiting each of the harbours and villages and seeing for yourself. The North Yorkshire and Cleveland Heritage Coast is also a geologist’s dream, you can find polished belemnites embedded in the rocks or pick up ammonites on one of our Real Staithes courses if you want ‘the hands-on’ experience of finding and cracking open your own fossil. If you want to learn more about fossils then a visit to Whitby Museum or the Rotunda Museum in Scarborough is a must. Check out a film featuring the Heritage Coast here. This seaward edge of the North York Moors produces some great waves ideal for surfing, Staithes and Saltburn are magnets to experienced surfers who can enjoy the challenging conditions. 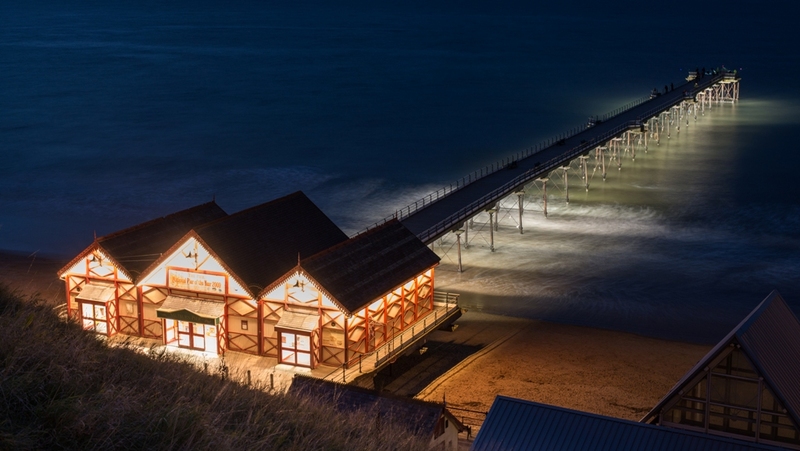 If you are visiting Saltburn and wanting somewhere to stay then try The Spa Hotel, you’ll be able to check out the surf from your bedroom window. If you want to try your hand at fishing we have a Charter Angling boat ‘All My Sons’ that goes out of Staithes. If you’re after fresh fish but don’t actually want to catch it then you could visit Whitby Seafish for some of their fabulous oak smoked salmon or for those of you who don’t really want to cook try To Dine For Lisa will provide ‘Professional Food Anywhere’. Looking for Bed & Breakfast in Staithes, Endeavour, Roraima House or Trig Point. Deep, broad valleys dissect the North York Moors National Park, with hidden winding roads that suddenly lead to surprise views. This is a traditional pastoral farming landscape that often feels timeless. Wonderfully-named valleys such as Great Fryup Dale, Rosedale and Farndale weave in and out of the central park area. Farndale is famous for its spring displays of wild daffodils and you can also see them in Rosedale. Check out a film featuring the Hidden Valleys here. While this area is a traditional rural landscape it was once scattered with industry, especial ironstone mines, you can use the ironstone pigments to make paint. Learn how on one of our Real Staithes day courses. Glaisdale is an ironstone mining village set at the mouth of Glaisdale, one of the North York Moors’ most stunning Dales and on the route of the Esk Valley Walk. 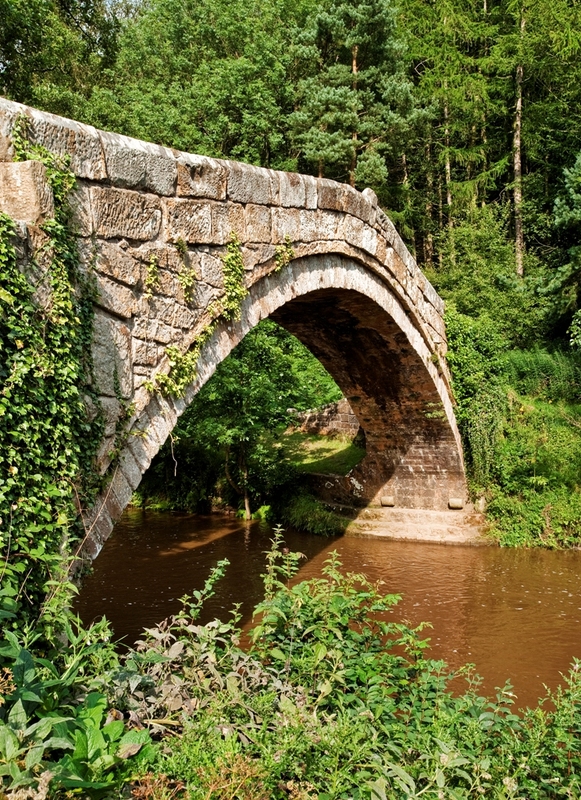 Admire Beggars Bridge, an old packhorse bridge by the river Esk before following the stone trods through Arncliffe Woods, part of an ancient pannierway used in the past by monks, packhorses and travellers. If you want to expore this area over a few days and are looking for somewhere to stay try Crag House Farm in Danby. The North York Moors National Park also has an abundance of forest and woodland, with ancient trees and diverse flora and fauna. 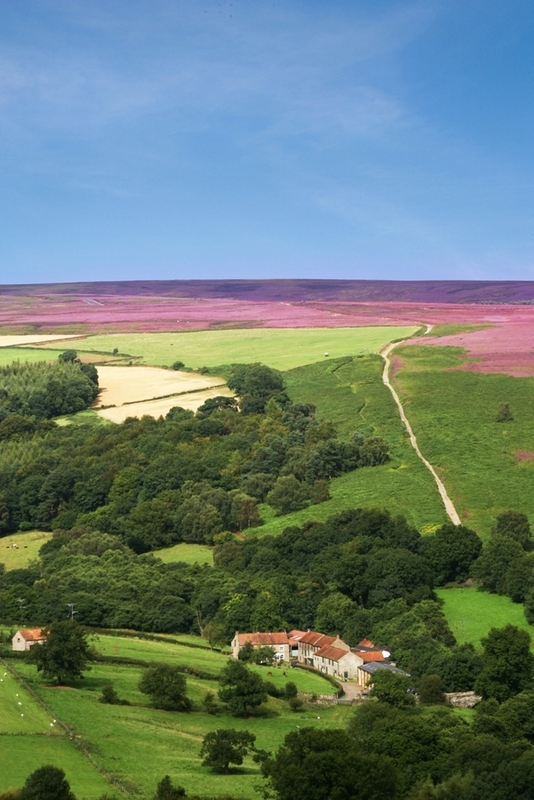 Did you know that the North York Moors has more trees than the New Forest National Park..? Visit the forest of Dalby, Wykeham and Cropton to see for yourself..! Check out a film featuring the forests and woods of the area here. The Esk Valley Walk follows the river Esk from its source high on the North York Moors to the coast at Whitby, mirroring the Esk Valley Railway and taking in traditional Yorkshire pubs along the way. Two National Trails that run throught the area are the Cleveland Way and the Yorkshire Wolds Way. Talented artists and craftsmen are to be found throughout the area many of whom open their studios to the public for two weekends in June, North Yorkshire Open Studios gives visitors to the North York Moors the rare opportunity to meet painters, printmakers, sculptors, textile artists and designers in the places that they work. Find out what inspires them, how they create their art and maybe spot a masterpiece in creation at one of the many quirky studios. The Staithes Festival of Arts & Heritage is also an opportunity to meet many different artists and craftsmen. Two artists, who are worth visiting in their home studio in Staithes, are Niamh Hanlon and Tony Murphy – Staithes Art. Niamh works in watercolour while Tony is a photographer. Discover the legacy of Robert Thompson at The Mouseman Visitor Centre in Kilburn. The furniture maker became famous across the country for his pieces in oak incorporating a small carved mouse, examples of which can be found at Ampleforth Abbey and at Robin Hoods Bay. John Bunting was an art teacher at Ampleforth College and a talented sculptor. He rebuilt the beautiful Scotch Corner Chapel near Oldstead in memory of friends killed in the Second World War. There are regular open days at the Chapel when you can see many of his sculptures. If you’re wanting somewhere to stay in the Ampleforth area try Carr House Farm for a very friendly welcome. Do check out Squid Beak who promise to be independent and honest about the Yorkshire food and drink landscape. One way to experience the area is to take your accommodation with you have a look at Castle Coast Campers, hiring a camper van is a great way to explore both the North York Moors and surrounding area. Check out a film featuring the North York Moors & the Howardian Hills here.